The finale of having the discussion about feelings was brilliant in helping children understand where us moms (or dads) are coming from. It might even be an eye opener to some that explaining feelings and emotions might just go further than yelling. I loved the book and can't wait to see more from Ms. Ellis. The illustrations by Don Berry were eye catching and "cutsy" to catch the little one's attention. We're getting close to moving to a new state but I'm not packing this one away until the very end. I would recommend this book to any family as it has a great lesson to learn. That Baby Woke Me Up, AGAIN! also written by Sherry Ellis and illustrated by Don Berry is another wonderful book introducing a chapter from life to our children. Many children understand how a new addition can affect their lives but I think the most memorable one for me was being waken up through the night. The story of interrupted dreams, frustrations and missed sleep is narrated by a big sister and how she tries to cope. It's a great book to show that the sleepless nights are just temporary and that it's a normal situation when a child has a new brother or sister. I also enjoyed how Ms. Ellis used rhyming versus as for me, it's catchy and my children tend to be more entertained. We have a baby in our house but they are lucky in that they don't have their sleep interrupted. If they had, this would have been the ideal book to show they aren't alone and that it's just a passing phase. Click here to learn more about Ms. Ellis. Click here for her blog. Click here for her Facebook page. Click here for her Facebook fan page. Click here for her Twitter page. 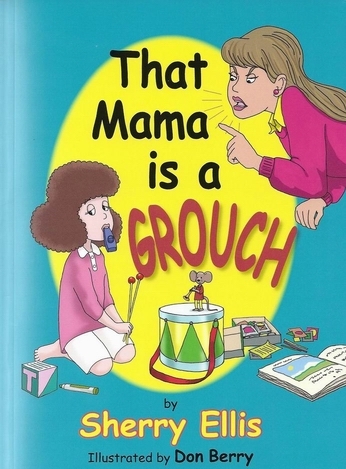 That Baby Woke Me Up, AGAIN and That Mama is a Grouch can be purchased at Amazon, Barnes and Noble, Baker and Taylor, Ingram, Books a Million and Blue Manatee Bookstore (Cincinati). I would recommend this book especially to parents with new babies and older siblings. *Disclosure: These reviews of Sherry Ellis' books are part of the Stories For Children World of Ink book tour. I received complimentary copies for the purposes of this review.